1. Prayer-Ask God to give you a greater desire for His Word and a longing for it. He will open your eyes to behold wondrous things. Along those lines, one of the great joys of Bible reading is actually praying the Scriptures you are reading. I’m confident that God would love to hear us pray that our desire for His Word would grow. A large part of Psalm 119 is actually a prayer for a heart that needs more of God’s Word. 2.Pace-Take it one day at a time. If you fall behind, don’t worry about catching up until you actually have the time and don’t read out of guilt. Remember, the goal is not just completing a plan in 365 days. The goal is to know God better and to love Him deeper. Set aside one day a week as a “catch-up” day where you can either read what you miss or go back over sections that really spoke to you. 3. 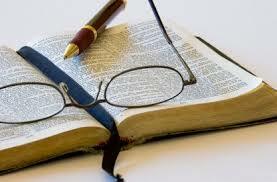 Practice-Don’t just read for information, read to be joyfully obedient. The last thing your family, church, and city need is people who know a lot about Jesus, but don’t act like Him. We are warned repeatedly not just to be hearers, but doers of the Word. 4. Person-Don’t read the Bible just to joyfully obey. I know it sounds like I’m contradicting number 3, but oftentimes in our desire to obey, we forget that the Bible is really about God and His interactions with man. Ask yourself, “What does this passage teach about the character of God?” “Is there something in this passage that relates to a promise He made?” If you read the Bible to find some “principle for the day,” you can end up moralizing the Scripture instead of staying true to the meta-narrative. For the past couple of years, I have used the ESV Chronological plan. It is helpful because it puts portions of Scripture together that belong together, both in content and chronology. A helpful plan for beginners is the 5x5x5 plan. It takes five minutes a day, five days a week, and gives you five thoughtful ways to dig deeper into the truths of Scripture. If you prefer to stay in one book of the Bible at a time, then this plan is probably for you. If you like variety throughout the week then the plan for Shirkers and Slackers or the Discipleship Journal plan may be for you. A creative approach that has you reading whole chapters, along with quarterly attention to specific books, is Trent Hunter’s The Bible Eater plan. The plan highlights OT chapters that are crucial to the storyline of Scripture and redemptive fulfillment in Christ. The people at Ligonier have a list of plans that include some of the once I have referred to, but several others as well. If you use a smart phone or tablet every day, then You Version may be a great way to keep you in the Word. They send helpful and encouraging e-mails when you fall behind. What plans have you used in the past? What plan will you use in 2014?